Considering how much of the classic Bond formula is established in Dr No, From Russia with Love feels incomplete. It misses some of the classic Bond material that has made it such a long-lasting force and because of that, I couldn’t quite get behind From Russia in Love. The film made me feel like something was always missing. The plot is a very good one and has slightly more depth than your usual Bond affair. It is a tale of double-crossing, deception and undercover antics, as Bond tries to defect a Russian secretary with secrets while she tries to get close enough to Bond for her own nefarious deeds. The organisation behind it all – SPECTRE, make their first real appearance and tie closely with the first movie, giving this a true sequel feel. Sean Connery helps that feeling as well. He is comfortably Bond and begins with his usual womanising and harsh violence. He flips between action hero and suave spy very well and you can see the blueprint that other actors would begin to work with. In fact, Bond is probably more rounded out and set here than ever and it would be up to other actors to play with that and change it if possible. The Bond girl role is arguably much more important here than usual. It is seducing and flipping the Russian Tatiana to the British side that is so vital to the plot and we have the beautiful and also deceptive Daniela Bianchi to thank for this. She begins as a match for Bond before becoming quite pointless and wasted as the film progresses, especially towards it’s train based finale. Every Bond film is only as good as it’s villain though and here is where I struggle with this movie. It doesn’t seem to have a convincing, powerful foil for our hero. Instead we get elevated henchmen who are quite quickly and relatively easily dispatched. Jaws’ Robert Shaw plays the “main” villain as Grant. 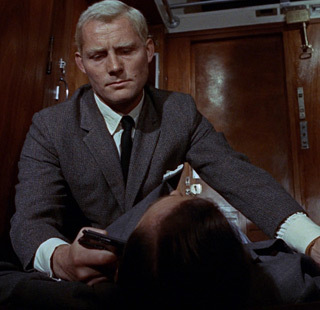 He is a physical and intellectual match to Bond and their confrontation in the train in the third act of the film is very tense, with some great acting from both Shaw and Connery. Their chemistry is under-utilised, as is Shaw’s Grant throughout the film, and the threat is dealt with quite swiftly. The second and more famous villain from the movie is Lotta Lenya’s Rosa Klebb. The knife-shoe wielding henchwoman is laughably easy to dispatch considering how much over-arching threat is built for her. It makes for an anti-climactic ending to the movie which doesn’t quite deliver the suitably large third act set-piece you would expect from Bond. Of course, that doesn’t mean the film is without it’s action sequences. Bond being attacked by a plane, which was probably quite exciting back in 60s, is laughable and lame by today’s standards.The boat chase is slightly better and there are plenty of scrapes, scuffles and violence along the way. Nothing stands out though and it could be interchangeable with any future Bond film that follows. To From Russia with Love’s credit, it does introduce one stalwart from the Bond series. Desmond Llewellyn’s Q delivers his dry-wit while offering up some of the gadgets that would become another standard from the series. This feels like the only major aspect that screams Bond though and I think the movie suffers because of it. Overall, aside from Connery’s definitive portrayal as Bond and the introduction of Llewellyn’s Q, From Russia with Love doesn’t feel like a Bond film. It lacks the decent villain that Bond needs, it has a good Bond girl but doesn’t utilise her fully and the set-pieces don’t live up to what we recognise as Bond. Good review, I mostly agree. Shaw was great, but under utilized like you say. Glad someone agrees with me for once. Thanks for stopping by.